< Back to the map (alternative version) or the index list. Tennyson visited the shop on Gate Lane with his son Hallam to see some of his published works on sale. The picture on the left (below) shows how the shop looked while Tennyson was alive & the picture on the right shows the shop today. The picture on the left (below) shows Tennyson’s local grocery shop on the intersection of Bedbury Lane & Victoria Road. The picture on the right shows the shop today. 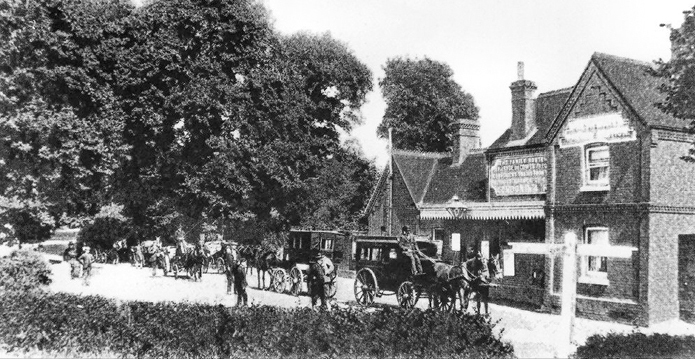 The photograph below shows Freshwater railway station around 1870. The station, which no longer exists, is located to the north of the map.